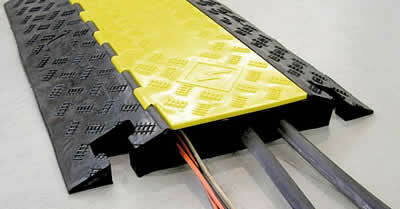 ​Moulded rubber cable protectors designed for the temporary protection of both assets from damage and pedestrians from tripping hazards. Available in either 3 or 5 channel designs. The bodies of these rugged cable protectors are manufactured from a combination of new and recycled rubber, while the hinged lids are tough flexible rubber/plastic composite in hi-vis safety yellow. Recommended for short term, light duty vehicle and pedestrian traffic. Not recommended for forklift or truck traffic.